The Bark in Tallahassee's All Saints neighborhood was helping battle Alzheimer's disease on Saturday, Feb. 9. The event was to support an even larger upcoming fundraiser. The Alzheimer's Association's Yasmin Khan said just about everyone now knows somebody who is afflicted with Alzheimer's. "Our vision is to end Alzheimer's disease and in doing so we would hope we can bring folks together just to understand how important it is that we find the cure and that we fund education and programs for those who are currently living with Alzheimer's disease or affected by the disease all together." 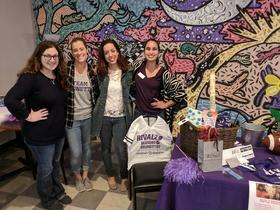 She said Saturday's "Galentine Brunch" at The Bark provided a financial head start for the "Rivalz Tallahassee" event. "We are a charity flag football game, entirely women-led and volunteer-driven," she explained. "And our goal this year is to raise $35,000 for Alzheimer's care, support and research." She said that will happen on May 5th at a local football field to be announced.